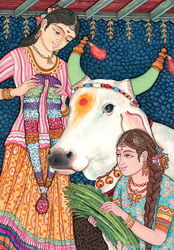 In India a cow is a sacred animal, symbolizing fecundity, abundance, earth, personification of both sky and earth. For ancient greeks a goddess Gera and Io appear in the look of cow. In many traditions a cow personified fertility, abundance, prosperity. In the article materials of network are used the Internet. Hypotarsus (simple bone). The most accessible bone, suitable for a screw-thread, is cevka (bone of the large horned animals and cattle). This bone was used in the decoratively-applied art. From it it is possible to make small boxes, cups, jewelry and other great deal. Bone is plastic, well processed a drill and hand instrument, added a polish, is sensitive of fat spots. Screw-thread on the bone. Pre-treatment of material. First a bone must be cleaned from extraneous. It is done through a 18-22% penozone. The pills of peroxide can be found in pharmacies, solution can be made independently. A peroxigen in a 20% solution is a caustic liquid, not to mention about pills. In solution the bone of animals is held hour-one and a half. Whereupon to wash water, to dry out and wipe a rag, smochenoy in a 646 solvent (solvent 647, acetone). It is needed for depriving of fat. In theory it is possible for this purpose to avail by any domestic purifier of tableware. Master class. Before to begin treatment of bone, it is needed to deprive of fat and bleach it. In few words - as prepare a bone. Use beef bones from a market. Before cooked during one and a half-two clock in the calcinated soda, but taking into account quality of bones, forced to give up the protracted boiling-out. Cook a half a hour approximately, unite after, change water and pour new portion of soda, abandon for the night in this solution. From itself personally will add. Making of religious rosary from the bone of yak (attributes for man) popularly in mountain Nepal (Asia), it is traditional folk trades of this alpine state. District of Shambala, Kailas and Tibet are bangles from a bone (wickerwork). Making of bijouterie from the bone of bull and cow characteristically for the people of India are original necklaces, beads, pendants, ear-rings and bangles, and also a necklace with the use of decorative elements, intagliated from a bone is beads of various form, rings from the bone of cows, images of elephants are traditional popular animals of India, leaves of plants, screw-thread for bones, dekor from a goldish composition-metal. Unique is the bone painted over under a wood from India (very look like a dark natural wood, I entangled - it is not needed to wet good of toning color from a bone in anything). Bone more lasting, than wood, it is possible to entangle. Natural bone of cow and bull from India, where a cow is a sacred animal. Necklace!! Beads-necklaces are long four-row with round beads (painted) "Leaves"
Bone is difficult in treatment material, heavily added treatment and burning-out. On this good from India were additionally inflicted by a burning-out the Scandinavian runes. Bone is popular material for causing of runes. Under the bone of animals it is enough a wood and bamboo of different flowers is easily processed, tints and invoice of wood - painted or not a wood successfully can be given out for the bone of cow and bull (cevka), both natural color and painted over. A wood is usual easier than bone of animals and more frequent than all easily floats on-the-spot water in a dry kind. Higher on a photo a rosary from a wood, look like the bone of animals, is resulted, especially hornbeam, and runes. Imitations of bone are materials, look by sight like a bone. A marble onyx and coloured and white aragonit very looks like the bone of animals from Pakistan and other countries. Natural stone usually harder and heavier than bone. Look like the invoice of bone and skull - on a photo on the right intagliated from a marble onyx frogs. A marble onyx is sensitive of any acid, look like a bone and wonderful stone in itself. Imitation of bone, especially additionally bleached, also executed the tusks of animals - tusks of elephant (ivory is teeth and tusks of wild animals) and white plastic "under ivory" (I do not publish from the ethics considering). Elephants must live in nature with their tusks (teeth). Amber ("bone stone, bone amber") and other materials looks like a bone. A bone is counterfeit amber, tusk of mammoth, turquoise and natural stone. Bone cows and bulls is in itself is ideal modern material for wares and jewelry, relatively accessible and inexpensive, possesses wonderful decorative properties and processed easily enough (as compared to a stone). Wares from it, executed folk masters, were always famous. A wideuse in artistic trades has simple bone. Bone is sawed a handsaw on a metal, processed a file. Drilled drills, a screw-thread is done the coniferous forests by the flexible billow of bor-mashiny. Wares it is possible toning from a bone, painting is superficial, and also to apply the deep painting. Toning is made graphite powder or saturated solution of moist colours, in which good place on 3-5 mins. After toning otpolirovyvayut good on a clean rag circle. Toning underlines the depth of screw-thread. The superficial painting is made aniline or natural dyes. Natural dyes are ancient material of painting of bone. For painting a bone is deprived of fat, and then put on some time in the strong extract of dye. At painting a bow husk a bone is acquired by a red-broune tint, and tea is given by a yellow-brown color. Bone, painted expect or by a bow husk, does not almost burn down. For painting bone tea or bow husk (1 part) it is needed to inundate boiling water (3 parts) and to insist about hour in the closed tableware. In this extract a bone needs to be boiled thoroughly during 30-40 mins Wares from a bone it is possible to paint also by aniline dyes for woolens. They give even colourful coverage on which it is possible to engrave a white picture. But aniline dyes burn down in the sunshine (especially on a south and at a sea). The process of the deep painting is more difficult and requires the careful depriving of fat of bone. Bone is boiled down in the enameled tableware during 5-7 ch in solution of the calcinated soda (50 g on 2-3 l of water), wash warm water and dry out. Paint a bone in dyeing solution during 7-12 days in glass or enameled tableware. To get dark blue dye, conduct a 1 part of blue vitriol in 6-9 parts of water and add a liquid ammonia to the receipt of necessary color. In yellow a bone is painted solution of dvukhromovokislogo potassium in water (in a that proportion). For the receipt of green dye mix up 2 parts of dark blue and 1 part of yellow dyes. In a violet color a bone is painted solution of cobaltichloride. A brown color turns out at mixing of yellow (1 part) and violet (2 parts) dyes. To paint a bone in a black, it needs to be held for some the time a few minutes in hot decoction of dark blue sandala, and then to place in solution of acetate salt.